The 3 Biggest Cigar Stores In Texas! 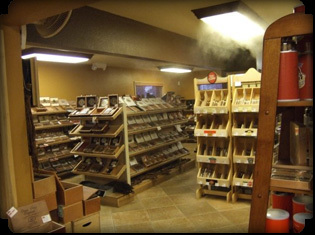 Our retail stores feature the largest walk-in cigar humidors in Texas! Each has over 1,200 square feet of space dedicated to a huge assortment of cigars, so many choices you'll feel like you're in cigar heaven! We have tremendous selections of the most popular brands in the country - Arturo Fuente, Padron, Macanudo, Oliva, Ashton... as well as tons of our own great quality, great value brands. As one of the top cigar shops in San Antonio we have a terrific selection of accessories including humdiors, cutters, lighters and ashtrays plus a nice assortment of pipes & tobacco, snus, snuff, chewing tobacco, and roll your own cigarette supplies. Our stores have smoking rooms open to our customers (no membership fees!) with free wi-fi and a never-ending supply of free coffee. Come in and read the paper, check your email and enjoy a fine cigar in our comfortable leather furniture. Whether you live in San Antonio or are just visiting, we'd love to have you stop by and meet our friendly staff. No matter if your taste is for a $1 cigar or a $30 super-premium, you'll know that we appreciate your business and will do everything we can to make your visit a great experience!